19/04/2008 - CLUB EVENT: NORTHANTS TWENTY20 AT CAMPBELL PARK! 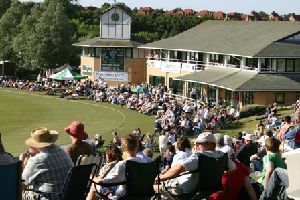 Members and partners of Shenley Church End CC are invited to attend another Club Event which organises itself - the annual Northants Twenty20 evening out at Campbell Park to take in some magical cricket and down the beers! As you all know, Northants CCC have kindly decided to repay their faith in Campbell Park's pitch (despite last year's deluge and postponments) by announcing two Twenty20 matches to be played in MK, both in June. I'd like to propose a club event for one of these - Northamptonshire's Twenty20 fixture with Warwickshire on Thursday 19th June 2008, with a 5:30pm start. Of course, in true SCECC style I think we should be aiming to get a drink in... maybe by repeating last year's early meet for all those who can make it! Luckily, the fixtures fall in my week's holiday, so some of the club's representatives will be taking refuge in Wetherspoons (The Moon Under Water in the Xscape) from 1:00pm to partake in cheap beers, ales steak and wine, burgers, Chicky's round, reminiscing with old folk, slanging matches with the local ASBO mothers (Andy: "why don't you just **** off!") and of course Jay's outstanding Bumble Bee outfit! If people wish to make some kind of theme, whether it be fancy dress or funny hats (excluding Jay, who must be in his outfit!) or whether club kit is required, let us know! Around 12 or 13 people made it last year... would be great to see as many of you as possible... so finish early, or book your afternoon off work and join in the fun! Tickets are only £12, and now on sale via the Northants website (link below) or by ringing 01604 514455. Click here to let us know your availability on the messageboard!